This Irish angel tree topper is made by Kurt S. Adler. 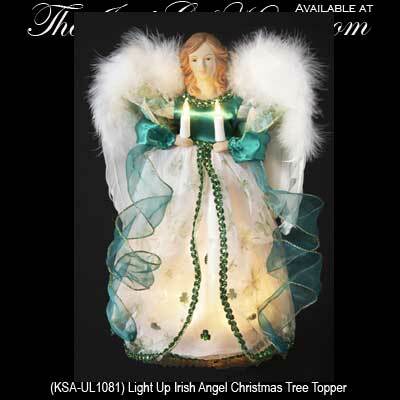 This Irish angle tree topper features 10 bulb ilumination and may also be used as a centerpiece. The Irish angle Christmas tree topper features light brown hair and shamrock dress: the electric adapter is included. The 12" tall Irish angel topper is made of fabric and porcelain and is gift boxed with the shamrock history. From Kurt S. Adler.